Today marks the one year anniversary of Sweet Peach! I'm so fortunate to have met such incredible Southern artisans who have been so gracious and open to me and my little blog. I appreciate all of you for letting me into your world, if just for a moment. Thank you to all my readers, bookmarkers and commenters...Thank you to Vanessa for your beautiful design, to Bryce and Kathryn for your guest contributions, to my mama for your love and baking skills and my sister for her editing expertise and undying support. Thank you, thank you...I feel so lucky. 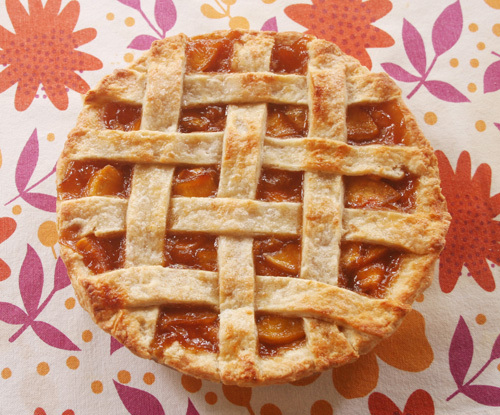 In return for everyone's kindness and encouragement, I figured what better way to celebrate then with a Brandied Peach Pie recipe (page 45) by one of my favorite Southern artisans, Maggie Sweeney of Cake Hag. Thank you Maggie for the best anniversary gift I could ask for... I ate the whole thing in two days. Insane. I hope you're inspired to make your own peach pie this summer as peaches are now in season throughout the South. Find Maggie's recipe at the Atlanta Intown Paper, June edition. Page 45! And thank you Wendy and Collin at Atlanta InTown who have been nothing but encouraging and supportive since day one.